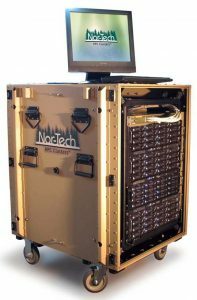 Nor-Tech’s ruggedized portable HPC cluster brings supercomputing capacity to nearly any location across the globe. Energy efficient and runs quietly with low heat generation, offering the highest available power at the lowest possible consumption—up to 128 cores on just two 120VAC 20-amp circuits. The ruggedized chassis meets applicable military standards. A double continuous gasket system with an automatic pressure equalization valve for optimal environmental protection. Shock absorbers line the chassis, keeping the system protected from sudden impact as well as sustained vibration. Sturdy, lockable casters roll smoothly–even over rough terrain–and can be removed and stored inside the unit. End caps seal the unit while in transit and allow easy access to the components from both sides when removed. Users roll it out of the crate, detach the two end caps, and plug it in almost anywhere power is available. The case is made of lightweight and strong aircraft-grade aluminum and can be individually branded with a logo and/or graphics. It can be configured with a variety of operating systems. Options include a shipping container with a rolling ramp. 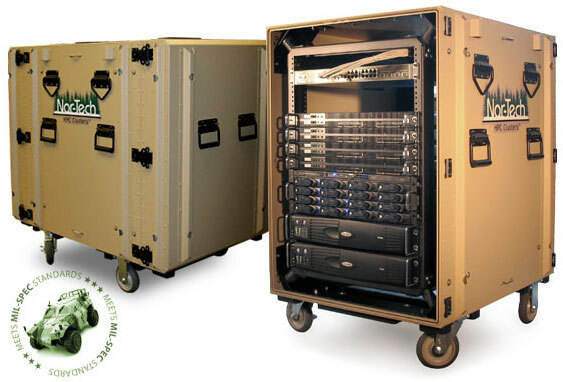 Portable cluster rackmount cases are available in both commercial and military configurations with a variety of optional features to accommodate components. Other add-ons improve component organization and expand functionality of the rackmount cases.